I'm a day late on these, but better late than never! 1. How did your parents decide on your name? They thought I was going to be a boy and when I popped out as a girl they had absolutely no idea what to call me. I'm told I just didn't look like anything and I think I went 3 days with no name. 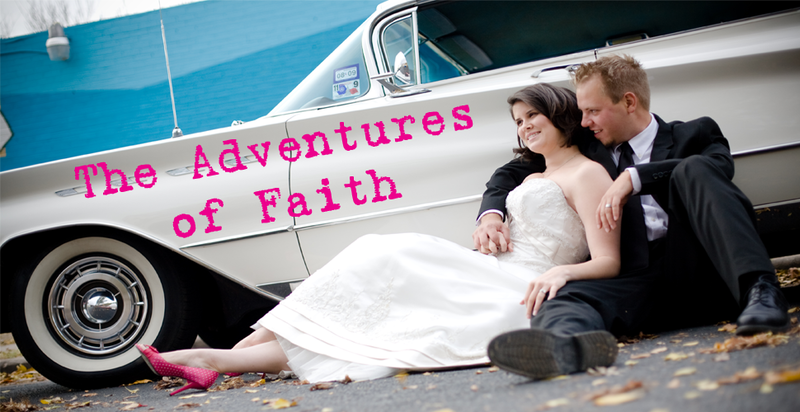 They decided on Faith because it was their favorite character from the soap opera Ryan's Hope. My parents worked in the same building when they first met and would go home on their lunch breaks and watch Ryan's Hope together. 2. Do your initials (First, Middle, Last) spell out anything fun/funny? FAH as in FAH LA LA LA LA. I kept my middle name, Anne, even though I hated it as a kid. My initials stayed the same which you would think is cool except after writing your name for 20 something years one way can screw you up. Every now and then I sign my old name. My parents also sometimes call me by my maiden name or write stuff to me by it and John often calls me by at as a nickname. Nope. My parents kind of did that - I was the odd ball and still am as my parents are Ks, my brothers are all Js, my older brother and I married Js and my little brother is dating a K. I remember my parents messing up my brothers names when they were in trouble and just saying "You!" 5. Did you decide on baby names as a little girl? Did you stick to them or change your mind? I probably did and have no idea what they are. Maybe I'll find them in the junk my parents gave me. 6. Does your family have any names that have been passed down through generations? Not that I previously know of, it's been a more recent occurrence. My brother and dad have the same middle name and I would like to use it if we have a boy. My little brother made his son a Jr. My older brother gave his daughter my grandma's middle name (they almost used mine). I plan on using my mom's middle name for a girl paired with John's grandma's name. John was named after his grandpa. 7. Do you look at the meaning of the name or just the name itself? Just the name although I do find name meanings interesting I don't think that really describes the person. People read so much into my name (if they're not singing to me that is). I think the fact that I was named after a soap opera character describes me so much more than any religious connotation that can be taken from me being named Faith. 8. Do you name pets with human names (Sally, Henry) or with pet names (Fluffy, Mr. Bo Bo)? Human names. Although I wouldn't be opposed to naming them pet names. I once had a cat named Kitty. 9. Are there any names that you have an affinity or dislike for based on a childhood experience/someone you once knew? No dislikes that I can think of. With all the moving around I did my best friend almost always ended up being named Sarah. 10. What are some of your favorite names? Why? Well, Lucas Alan would be one and is our boy name. Kathleen Mae is our girl name so I like both of those. I've always liked Michaela for some reason too. Cat named Kitty! : ) My kitty loves his name!